When we started the aquapoincs system, we were aware that the fish feed is a critical component of the system. The cost of the feed, as well as the quality and the reliability are all vital components of the entire Tilapia system. What you feed the fish affect what the fish produce as fertilizer, as well as their growth, which in turn affect the nitrates and all chemical levels. The fish produce nitrogen in the form of ammonia. The nitrifying bacteria use the process of nitrification to create nitrites, then nitrates, which is the form most readily available to the plants. This commonly happens in nature through decomposition – naturally occurring soil microorganisms break down organic matter for plants to absobe. The breakdown part is key. So to bring it back to the feed, what we are imputing into the system via feed is key. What’s produced locally, which allegedly has a high amount of fill (in the Dominican case corn meal or at a higher cost we can buy imported feed from Columbia, which we suspect is made with the fish fry off the coast of Peru. The coast of peru has a central location where mass amounts of fish fry end up, and that is harvested to create mass amounts of fish feed for the south american industry. We started by buying feed on a bimonthly basis. As we grew, our daily food consumption needs stabilized at about 5 pounds / day for the quantity of fish we are at now. The commercial system was about 4 pounds of feed a day. It’s worth noting that at that point the commercial system was no where near capacity, as we had had some issues with the hatchery at the moment, and we weren’t harvesting fish. Reading online, popular options for fish feed include duckweed and black soldier fly larvae. Duckweed I’ll leave to another post, for today, we are focused on the Black Soldier Fly larvae production for Tilapia in aquaponics and aquaculture. 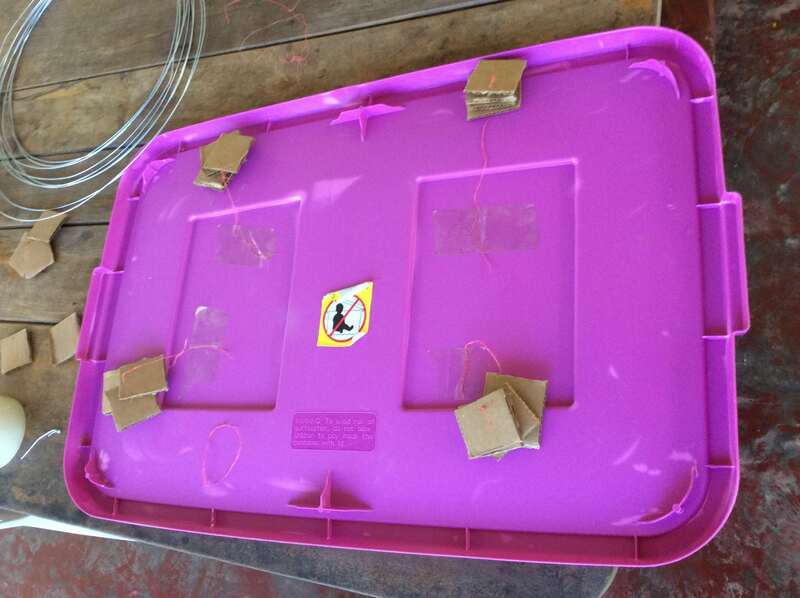 In april 2014 our intern Erik read up about Black soldier flies , and attempt to build something to grow them. He had some success on a small scale, so we knew that it was possible to produce them here but didn’t experiment past that first stage. In 2015 Nico arrived at the farm From southern France, He wanted to intern for two months learning about our Aquaponics system. As a scientist with a chemistry background, his project focus was the Tilapia feed. He studied feed alternatives of Duckweed, Black Soldier Flies and Moringa. Nico wanted to recreate the system, and grow it to the next level so he asked for Erik’s contact information. What did you give them to feed ? Regular compost from the kitchen? Chicken manure? Both? Are there traps I should not fall in when farming BSF? Today, I have started to build a breeding system to try to get a regular production of BSF. Do you have experience in it? Ok I realize there are so many question marks that I should probably stop here. Thanks again and good luck for your exams! How’s it going, man? I’m glad you’re out there learning about sustainable agriculture! The more you apply yourself out there, the more you will learn. I had a ton of satisfaction from my time at Taino and eXtreme because I identified things that could be improved, I worked hard to research and learn ways to do things better, and had fun with what I did. You can do the same, if not more. Okay so I’ll get off my rant and start talking about BSF. I’ll get back to you with more than this. It appears Robbie told you that I’m at the start of a very busy week at school so I hope you can understand. I doubt you will find the BSF larvae collector that I made- it was one year ago that I was last there. The designs on your email will both work. 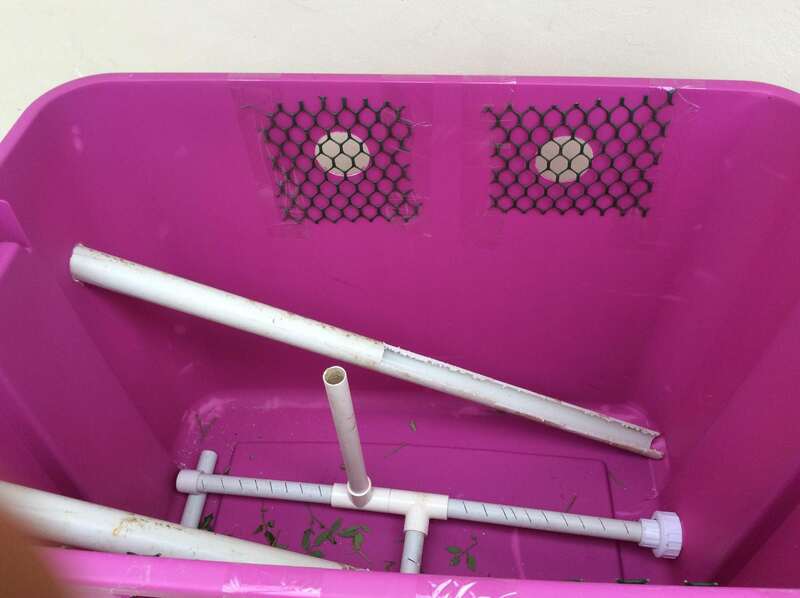 I think the design you chose from this website is better https://www.redwormcomposting.com/the-share-board/vermimans-diy-bsfl-bin/. I go with the first one because it is the most basic to create. Because you are in a country with a low amount of resources keeping things simple and basic is the best thing you can do. The BSF larvae collector does not need to be anything special- it will work. Just follow the basic rules that it should be dark- not clear, and it should have a ramp that goes upward at an angle of 30 degrees. Put food scraps (especially scraps from fruit) at the bottom of your collector and the black soldier flies will eventually smell it and fly inside of the collector to eat, then lay eggs which will hatch into larvae. The larvae then naturally look for an elevated place to go hatch into a fly. The models with a 30 degree ramp have proven to be the most successful. Which ever way that you decide to build your collector, you should make sure that the larvae can breath inside of the collection device so that they do not die. Once you have your collector producing larvae, you should never let the larvae stay inside the collector until they die. Living larvae, just like living produce, contain more nutrients and is a better source of food- so do what you can to keep the larvae alive. BSF larvae is a great source of nutrition for all farm animals and fish. It would be a great help to the farm to develop a system that produces a large amount of BSF larvae. I recommend that you start out small with your first design just so that you can learn the concept of how the BSF larvae collector works best at Taino. From there you may want to design a large collection system. 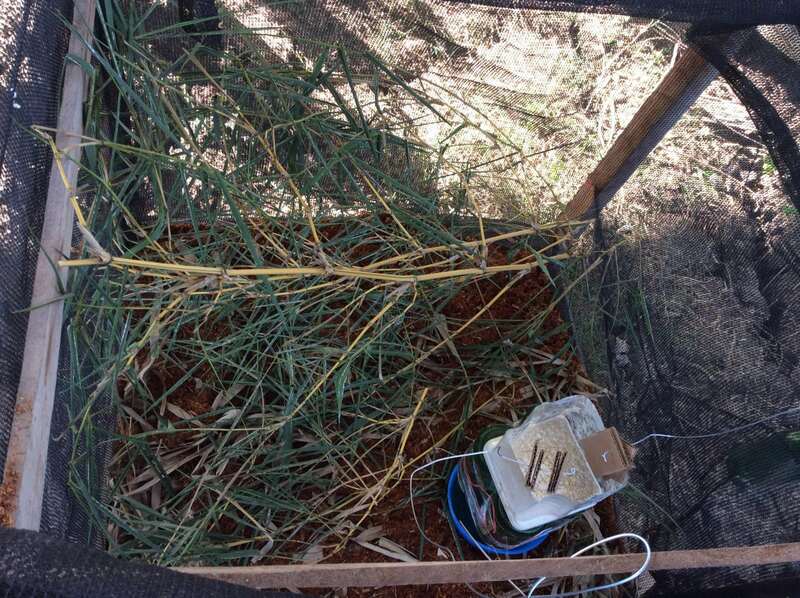 Have you been able to begin construction on a BSF larvae collector? Do you have any more questions about BSF or aquaponics? Please let me know if I can help. Take care. As for the aquaponic I build a system combining both designs with a slope of 30° as you suggested. I have just been to a chicken farm with Victor to pickup some black soldier larvae to speed up the production. I will keep you posted. That’s great! What are you using for an incubator? I wasn’t aware that putting larvae in the system would speed production. The way it normally works is that it takes up to two weeks before the BSF start laying eggs in the system. They need a good incubator where they can lay their eggs. If you’re picking up eggs then I can see it being a benefit, but larvae by itself would not help. Also it may be a concern about the scent of the larvae. The BSF leave behind a scent that warns off other insects- I’m not sure if it might affect other BSF coming into your collector as well. For an incubator I used a thick peace of cardboard with the outside layer ripped off. I taped the piece of cardboard to the inside of the food scrap area so that it was directly above where I placed the food scraps. It had lots of tiny spaces where the BSF could lay their eggs. You should think of it like a bees nest almost- the BSF want a small, safe area that they can crawl inside of to lay their eggs. Once the eggs hatch the larvae fall out of the incubator and into the food scraps. The larvae then eat some food scraps and crawl up the ramp and fall into your collection device. Please contact me if you have anymore questions. The BSF project will take some time to start producing, but with patience you will have plenty of larvae within a month. The idea of adding larvae with their natural substrate into the system to have already larvae with one or two weeks. Indeed, besides the growing tank, I also made a breeding chamber. By adding larvae I am saving one or two weeks for the breeding process. I have forwarded you the pictures of growing and breeding tanks. I will keep in touch to see if there are problems associated to the addition of larvae. I can see now a couple of big BSF larvae. They have not started yet to migrate but I guess it is just a matter of days now. I think the first days, there was too much water in the system and lots of small maggots migrate out of the system. Now they seem to be happy inside. First harvest today! Not much and I put all the larvae in the breeding tank but it’s a start! Production of black soldier larvae Black soldier larvae are certainly one of the most promising feed sources for a self sustained aquaponics system. They grow on kitchen waste, are easy to harvest and contain all the essential amino acids for tilapia and are pretty energetic with also a nice fatty acid profile. This is the system that is now on use at the farm. 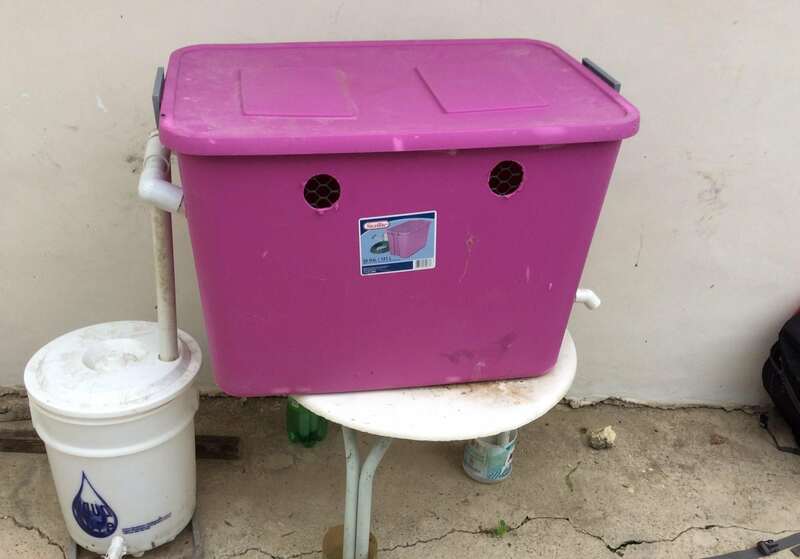 The pink tank is the growing tank for the larvae. When they are ready to metamorphose into flies they try to escape from the pink tank and fall into the white harvest tank. I put containers filled with water at the bottom of each feet in order to prevent ants from coming into the system. The holes on the side are for BSF from the wild to come and mate in the system. I put grids to prevent some birds and huge spiders to enter the tank. The pipes at the bottom with small cuts serve as a draining system and at the same time as an aerator to keep the container as much as possible under aerobic conditions. The mating system aims at providing a constant supply of larvae. The idea is to put some of the harvested larvae into the mating tank and let them reproduce. 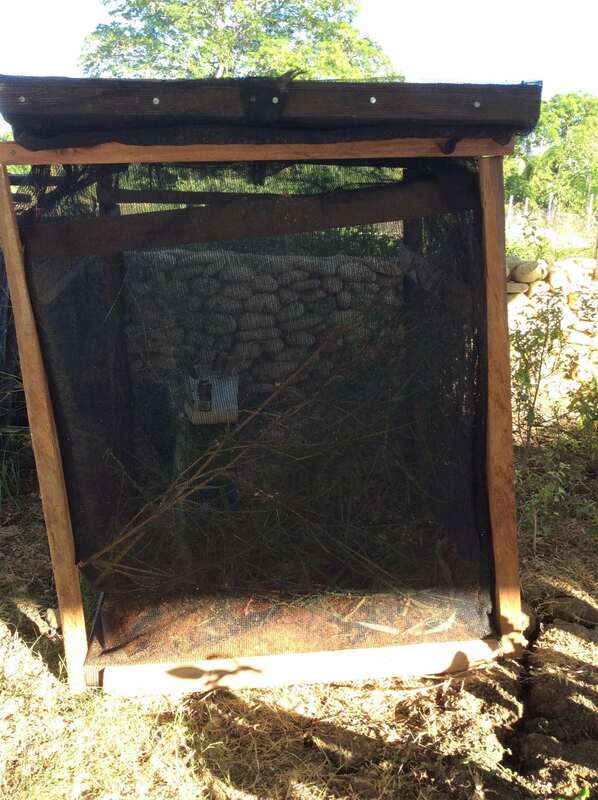 The mating system consists of an enclosing cage, with cardboard for the flies to lay the eggs, some branches to ease the lekking, a container full with oats soaked into water (other food is also possible) and mulch at the bottom of the tank to ensure that the larvae find a dry place to metamorphose. If everything goes well, the container containing oat can be poured into the growing system every week.